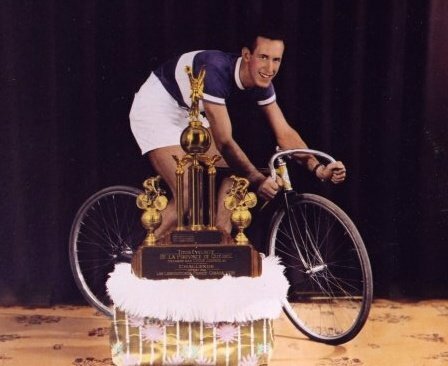 Ace Atkinson poses in the saddle with one of his many trophies. Ace raced for Canada at the 1948 Olympics. Lorne (Ace) Atkinson’s name is synonymous with cycling in Vancouver. He raced at the Olympics, coached Canadian teams, organized international competitions in his hometown. 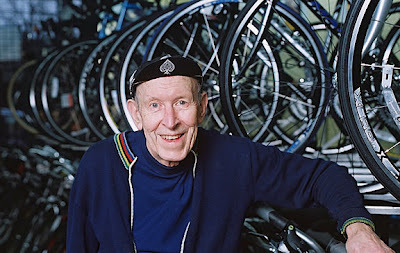 Atkinson, who has died, aged 88, was proprietor of a popular bike shop, where he outfitted generations of cyclists, from world-class racers to weekend sightseers. Ace Cycles opened its doors in 1946 on West Broadway, where it remains a fixture of the Kitsilano neighbourhood. The owner lived in an apartment above a store in which he could often be seen doing repairs, his hands covered in oil and grease. A fit, lean man with a ready smile, a racing cap perched on his head, Atkinson evangelized about the healthful benefits and sensual delights of two-wheeled transport. His business began as bicycles fell out of favour as a commuter tool, as the post-war economic boom made cars more affordable. For many years, the bike seemed to have been dismissed as a child’s plaything, or a European curiosity, though more recent trends towards fitness and non-polluting transportation have seen an increased interest in a 19th-century invention. Lorne Charles Atkinson was the son of a professional cyclist from Scotland, who became a coach in his new land. The boy grew up in a milieu where bikes provided entertainment as well as transportation. He attended six-day bike races at Denman Arena near downtown Vancouver. The marathon, which pitted two-men teams in a week-long showdown, proved a popular attraction at a time when an inexpensive ticket gave access to a warm, indoor venue for many hours. Atkinson grew up in eastside Vancouver, a few blocks from the Grandview Cut, a man-made ravine through which Great Northern Railway freight trains reached the nearby docks. During the Depression years, hobos appeared at the family home in search of food. The boy delivered Liberty magazine by bike, covering a large swath of the city, gaining stamina he later put to good use in road races. He won a race in Stanley Park sponsored by the Daily Province newspaper, which featured the young champion beneath the headline: City ace triumphs in Province Cup. He was known as Ace from that day forward. Atkinson won the B.C. junior title in 1939, later adding four senior provincial titles, as well as two national championships. Many of the races involved spills. Picking cinders from arms and knees was a common, post-race activity. In 1946, as part of the city’s jubilee celebrations, a bicycle show was held at Brockton Point in Stanley Park. A troupe performed a bicycle choreography routine. In the middle of the act, Evelyn Speer, known as Evie, suffered a flat. She was forced to push her ride, which, to her embarrassment, some of the audience mistook for a comic part of the routine. Afterwards, Atkinson offered to get her bike home while she took the streetcar. She thought the young athlete handsome, strong and gallant. (“He looked like the movie star Stewart Grainger,” she told Mr. Sandborn. “He picked that bike up and threw it over his shoulder — ‘Hello, Hercules!”) “Their courtship lasted six years before marriage in the summer of 1952. Atkinson emerged after the war as the province’s top cyclist, as well as one of the top riders in the country. He was the only Westerner included among a six-member team (two from Ontario, three from Quebec) selected to represent Canada at the 1948 Olympic Games at London. He failed to complete the Olympic cycling marathon — a grind of 120 miles, 1,647 yards on the grounds of Windsor Park — after suffering a tire puncture. He was not alone in his misery, as more than half the field of 95 did not cross the finish line. England continued to struggle under rationing. To save on petrol, competitors were encouraged to the cycle to the Herne Hill track for events. The Vancouver rider finished 15th in the 1,000-metre time trial, while the Canadian team wound up in tenth place in the team pursuit. Two years later, Atkinson coached and managed the four-man Canadian squad at the British Empire Games in New Zealand, the dual roles keeping him awake late at night as he sketched strategy and even completed equipment repairs. He was also a competitor, contesting five races, his best finish an eighth in the 100-km road race. The next gathering of the Empire’s athletes was to be held in Vancouver in 1954. A 250-metre banked oval track was constructed of cedar in a natural hollow at China Creek Park. Two days before the trials for the Games, Atkinson suffered a nasty spill, needing treatment for a lacerated left elbow. At age 33, he was surprised, but gratified to have been named to the team. A week before his event, coach George Graves of Montreal dropped the hometown cyclist from the 10-mile race. In protest, Atkinson left the Empire Village residences, though he returned upon reinstatement. In the end, he finished fourth in the event, narrowly missing a medal and a visit to the podium. For that race, he built by hand a track bike of his own design, a machine he was riding more than 40 years later. It should also be noted that Evie Atkinson held a senior position among officials as chief recorder at the Games, an early example of her volunteer spirit. She was a tireless advocate for her neighbourhood, lobbying for wheelchair access and for recycling programs. She was perhaps best known citywide for her campaign to preserve a steam locomotive that in 1887 had pulled the first passenger train to Vancouver. Engine 374 can be seen today in a pavilion adjacent to the Roundhouse community centre in Yaletown. She was named a member of the Order of Canada for her volunteerism in 1996. Six-day races had failed to recapture the public imagination after the war and the abandonment of the bicycle in favour of an automobile, even if only a jalopy, became a rite of passage for teenagers in the 1950s. In those fallow years, Atkinson almost singlehandedly kept interest in cycling alive. His shop became a gathering place for the sport’s few diehards. He imported the province’s first 10-speed bicycles from Italy in 1949, decades before their popularity became widespread. He served as a coach, including for the Canadian team at the Pan-Am Games at Winnipeg in 1967, and mentor for young athletes. He organized races to keep cycling in the public eye, including a popular three-day race from Penticton, B.C., to Vancouver. The couple was consulted when the city began forming plans for a series of bike trails. As a septuagenarian, Ace Atkinson cycled 160 kilometres a week, joining a 60-km ride every Sunday that started from his shop, circled around the campus of the University of British Columbia, continued along Marine Drive over a bridge to suburban Richmond and along the dikes to the old fishing port of Steveston before returning home. The long years of organizing were rewarded when Atkinson was inducted into the B.C. Sports Hall of Fame in the builder category in 1997. In recent months, ill health left him too frail to attend Olympic events. On a February evening, he rested in a wheelchair, swaddled in a blanket to offer protection from the February chill, when the Olympic torch relay passed in front of his shop. The runner presented the torch to the old athlete, who gripped it in his right hand. As he did so, the blankets slipped, revealing the blue blazer with red maple leaf crest he had worn as an Olympian 62 years earlier. Lorne Charles (Ace) Atkinson was born on June 8, 1921, at Vancouver. He died there on April 23. He was 88. He leaves his wife, Evie, his wife of 57 yeas; a son; a daughter; and, three grandchildren. Ace Atkinson wears a cap with his signature ace. His famous Vancouver shop was a mecca for cycling fans.